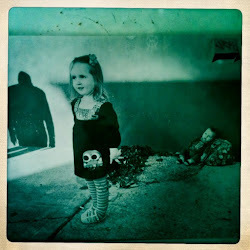 Hola Lola: Kids that Rock! We all think our kids rock right?!?!?!? Well, ours really does. This is one area where I'll be real blunt. Seriously, the child loves music! And good music at that. 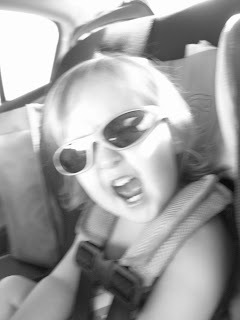 In this particular picture Lo was jammin' out to Wilco...head banging and all. Anytime good tunes come on the radio or tube, she throws her arms in the air and claps singing along to whatever great band happens to be playing. So, here's the important part of this blog....there is a competition called Kids that Rock on the KGSR radio station. We've entered Lola in the competition with this picture. We need EVERYONE to vote for Lola on Thursday, October 1st. Our goal is to win two three day passes to the fabulous Austin City Limits festival. This is a $400 value!!! If we win, then Molly & Ben will be able to join us for an experience of a lifetime. To recap - On OCTOBER 1st, PLEASE, PLEASE, PLEASE go to the website below and vote for our little Lo Bear. You know she is a rockin' kid so just do it!!! Adorable! I voted three times! :) Good Luck!! !